Cut up these veggies, chop-chop! Anyone who’s read this blog more than twice (Thanks, Mom. ), knows that my all-time favorite soup making appliance is the immersion blender. It’s great for pureeing soups, making salad dressings, tapenade, even smoothies. What the immersion blender doesn’t do is—slice, dice and julienne. For that I use my less favorite kitchen tool: the mandoline. Correction: Okay, the mandolin doesn’t dice, but slicing and julienning? You bet. If you’re not familiar with the mandoline, imagine a high-brow French version of the Veg-o-matic. Then throw in some stainless steel, a lot more precision and, dare I say, a little elegance, and you’re there. It’s great for slicing potato chips, even waffle cut chips, and it’s ideal for slicing zucchini, but to tell you the truth, that’s about it. My trouble with the mandoline is that if you try slicing anything firmer, i.e. carrots, parsnips, beets, you have to push too hard and before long you wind up with the kitchen equivalent of severe tire damage on your thumb or the heel of your hand. This is especially true if you’ve got one of the julienne blades in place. Any wonder why this utensil hasn’t found its way into one of these blog postings? But again, when you want matchstick cuts of zucchini, you couldn’t ask for anything better. And that’s precisely what I needed this week. Years earlier, I had tried to make a pasta sauce with zucchini, arugula and parmesan but it hadn’t worked out very well. The dish was something of a whim that I threw together for two friends in Seattle who are both really good cooks, especially when it comes to Italian cooking. One’s a native and the other lived in Italy for several years where he starred in an Italian soap opera. For that sauce, I’d done all the slicing by hand, but no matter how I sliced it, the sauce came out way too dry and I hadn’t reserved any of the pasta water to revive it. Our friends were very polite about it, but I was both embarrassed and disappointed and wound up putting away any thought of this dish for about ten years. Then last week as I was thinking what to do with arugula in terms of soup, I found this recipe in some long-forgotten pocket of my brain. Since dryness isn’t usually an issue in soup-making, I figured it might work this time. It was something of a rush job which is why I went with the mandoline. I didn’t have time for the fine cutting I needed. Two julienned zucchini and two yellow squash later and my soup was ready to go in the pot and if the prep work was easy, the cooking was even easier. I sautéed some onion and garlic, added the squash, stock and seasoning then I did a little simmering. After a while, I folded in the arugula and I finished it all off by stirring in the parmesan. It was pretty well received at the family dinner table too. My wife would have liked it better if I’d chopped the arugula instead of wilting it into the broth. But both girls ate it up without much complaint and I couldn’t really expect more than that. Arugula isn’t very kid-friendly after all. What’s more, the soup’s already all gone. My wife took all the leftovers into the city to feed her writer/performer friends and they helped us finish it off, big leaves and all. So what’s all the fuss about chopping? Heat the oil and sauté the onion and garlic over medium. Add the zucchini, squash, stock and seasoning. Bring the soup to a boil then reduce it to a simmer for 10-15 minutes. Add the arugula (chopping is optional) and let it wilt for a few minutes. Fold in the parmesan and serve warm. We had it with grilled salmon, but the soup is really fresh tasting and will go with just about any light spring meal. Image Credit: “Mandoline with Veggies,” from Matfer. 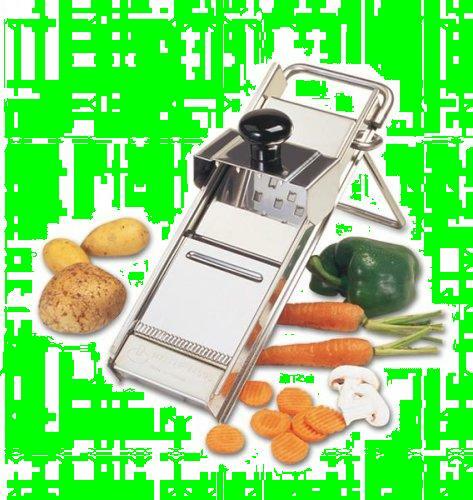 We never had a Veg-o-matic at our house, nor have we got the “classier” slap-chop. Typically a knife or two will do the trick for us. I still like the mandoline but it’s not quite an immersion blender now, is it? What’s your favorite cutting tool? Let me know in a comment.